Now viewing threads 1-25 of 142.
is there a way to simulate resonant inductive coupling? Capacitor to deal with inrush current in starting a small DC motor? is circuit lab giving me the wrong plots? Difference between a voltage source and a battery? Why is the current negative in this circuit? 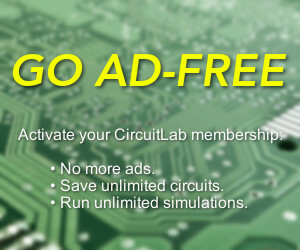 CircuitLab is an in-browser schematic capture and circuit simulation software tool to help you rapidly design and analyze analog and digital electronics systems. "Why value of DC capacitor in..."
"How can I switch off the grid?" "Shaded pole motor powering help"
"Clipping at high voltages only?" "Another vote for thermal modeling /..."